Teams of 3 will face off against each other in an attempt to complete the most meteors successfully. Teams will have one hour from the start to return back to their respective podium within the Arena. 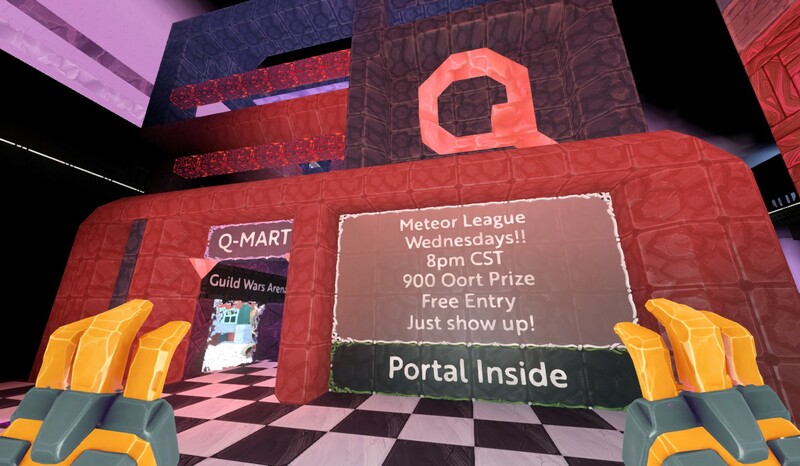 Upon return, teams must turn in ALL oort collected from meteors for judgment and the prize purse. Teams will be accompanied by a referee that may participate in the hunt but NOT count towards rewards. Teams MUST stick together until meteors drop. Each Team will need to designate a Captain to rename signs, collect oort, and register the team early. Registration opens for all ONE hour before match start. Teams are expected to be fully present 15 minutes before start. With respect to the european community, be on the look out for irregular weekend matches. I apologize for not being able to offer a friendly timeframe for you, but that is something I am looking into. Also looking to Hire Referee’s for these events. Offering 5,000c and you keep what you collect. Referee’s must be present 30min before the match and must use a supplied slingbow and supplied grapple. Duties - Follow the teams, ensure no funny business occurs. track time for the team, track number of meteors. Report all back to event marshal. Requirements - Max agility. Also prefer, grapple skills and general ability to navigate terrain quickly. For Questions or reservations please ask!! All portals lead to a market, in which you will find “Q-Mart” and the portal to the Arena. From the Meteor tournament I have decided to limit teams down to 3 to allow for more opportunity. Guilds may enter multiple teams. Only 9 teams per event, or as many as the chosen tier of planets provide for. Champions hall will eventually be erected to commemorate all victors. Shops and sponsorship invited. Rent a billboard or set up a shop to buy all the goodies the hunters will bring back, or cater to their hunting needs. At the moment the portal from Q-Mart is closed. I’ll open it tonight for curious prospects. Hey! I should be good for this one! I’m going to see if I can get a team together (since I finally joined a guild). If not, then I’ll be a Ref! soo the oort you get and dont spend on the price of the winners is kept be yourself? Kinda seems silly you have to give back the oort you’ve earned. It makes sense for the referee to give it back as a reward, but why should the teams, who have spent an hour working hard to get that oort, be forced to give it back? That’s how the winning team gets the oort prize. They also still get the monster drops and gems, right? He did this before and I believe it was pretty fair. It also had a coin purse attached to it last time though and a huge prestige amount too. The extra amount I think is a fee for planning and organizing everything. Yes I will keep the extra. It will be used for insurance of future prize purses to be 900 Oort as well as fuel several of my public farms. I may put some up for sale if I have lots of oort. Without some loss, there is little sweetness in victory. Everybody turns in their oort to fuel the prize purse. Qauntities to be rewarded may increase if popularity increases and a match pulls in more than 1800 Oort. But how many can aquire 900 in an hour? If lots of people and 6 teams show up, sure i’ll increase it to 2 stacks while shaving some for myself. And rather than using a fixed entry fee, a post competition fee will allow for more people to participate up front. Oort is my chosen payment because it holds the most value. And I Want Oort I’ll be straight with you. But you get to keep all your creature goodies and expierence and entertainment from competing against other players. If i were to make this a coin entry fee in order to supply a winners purse, I would have to charge 5k per player with at least 10 people to pay and play in order to provide 50k to the winner. I figured Oort was more appealing. If that is the way you wish to run it, than who am I to judge? Thank you! This is really what im going for. Im not trying to scam anybody but i do have my own objectives. One of them is creating new endgame material in the form of public events, the other is starting a corporation that provides many useful farms for the public. I like to think im taking advantage of a sandbox game. Yep! I understand it! Also, @Vansten, you could just supply all his referee needs and then you get paid for collecting Oort only for counting Meteorites completed, right? Now that’s a win! We weren’t there for Oort. Mittens can have it all. I was just there for a great time and it did not disappoint. Mittens if we win I still want that trophy. You better make me one! I can fund it. Maybe having these smaller ones would be good, and then having a large one every season complete with trophies? I’ll plan for a big tournament again in a month give or take. I’ll work on gathering some more gold and silver and I’ve got a guy to design the trophy this time. I’ll make sure it’s worthy. I’ll also speak with Legends and see if they are interested in turning the original trophy into a traveling trophy with major tournaments once a month. But that will be totally up to them. Otherwise i’ll build another big one. ok Mittins sign Iconic up for at least 1 team Wednesday night. Just officially heard back from my Guild! Sign “The Golden Fist” up as well! In addition, we have a new shop set up at the arena too, so if anyone needs to do some last minute shopping on anything they forgot or try a new weapon, thats the spot! The second story also has a viewing area so you can cheer everyone on in style! And a set of request baskets specifically set up for hunters to turn in all their goods from the hunt for some coin.